The subject of which glue to use for aanraku ‘Glue-on’ bails for jewellery is a common one and one that is hard to find definitive answers. The result of my research was confusion, mainly because there were many conflicting reports. The most common glue used seems to be E6000, but while the majority of users seem to like the glue, there were also many that did not have great experiences. To check my options I made note of other glues used and did find references to several. However, here in Australia I found it almost impossible to get these. No use finding a great glue I couldn’t purchase. A check of our local outlets and some discussion led me to Araldite Ultra Clear as a possible alternative and it was readily available. I did call the company and ask which of their glues would be most suitable for my need and they did confirm that the Ultra Clear was the best solution. So here are the results of my tests comparing E6000 and Araldite Ultra Clear. To test the glues I decided to glue a number of silver plated bails onto a smooth piece of glass. When I say ‘smooth’ I mean smooth. The glass was more like plate-glass finish rather than the slightly textured surface you find on the back of fused glass cabochons. My reasoning being that if it stick to a really smooth surface then it should be good to use. Glass cleaned, with water only. Glass cleaned with Methylated Spirits. Glass smooth and not roughened. Glass roughened with a silicone carbide stone and Dremel tool. All bails were smooth and not roughened. Being silver plated I did not want to remove the plating. If you use sterling silver of some other material, roughing the surface would be a suggestion. Araldite Ultra Clear glue on one surface. Araldite Ultra Clear glue on both surfaces. E6000 glue applied both surfaces and immediately brought together. E6000 glue on both surfaces, left to tack off (about 5 minutes) and then brought together. E6000 – Ground glass and not ground, cleaned with water only and spirits, glued both surfaces, no wait. E6000 – Same again but waited for glue to tack off before bringing the surfaces together. Araldite Ultra Clear – Ground glass and not ground, cleaned with water only and spirits, single surface glue. 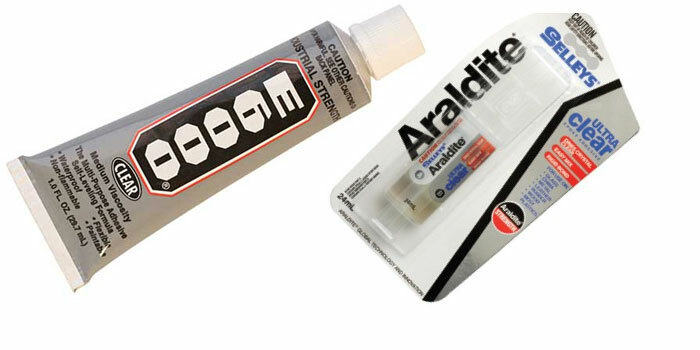 Araldite Ultra Clear – Same again, but glue to both surfaces, no wait. The Araldite Ultra Clear instructions say to apply the glue to both surfaces and then bring together, no wait. The maximum strength is supposed to take around 16 hours. The tubes of E6000 glue I purchased did not come with any good instructions. I had to refer to the internet to find suggested instructions. The result seemed to say I should apply it to both surfaces, wait for a few minutes for it to tack off, then apply with some pressure. Maximum strength seemed to take up to 72 hours. Using the E6000 is messy. It forms long stringers of glue at ever step, resulting in glue on everything if you are not careful. The glue seemed to go off very quickly, within a couple of minutes, so you need to work quickly. That is an issue when there are stringers of glue you have to worry about at every move. In the test where I waited for the surfaces to tack of, I did use a good amount of pressure when bringing the surfaces together. Using Araldite Ultra Clear is a little easier. It is quite runny so you do need to watch the amount used or you will have it squeezing out and a mess to clean up. It also goes off quite quickly, but I did feel I had a little longer to work with it. There wasn’t much in it. The main issue with Ultra Clear is it is a 2 part glue and you need to mix equal amounts. The pack that has the 2 parts in one unit was not easy to use. The plunger didn’t guarantee equal parts came out. Even clearing the nozzles didn’t guarantee the glue came out of each tube equally. Then there is the cap. Be sure to put it back on the correct way. If you put it on wrong you will cause the glue to harden in the tube as the glue left in the cap mixes in the tube. It does have a little guide on one side, but it is easy to still push the cap back on the wrong way. For both glues, make sure you have everything set up and ready to go. You won’t have time to waste finding tools or anything else. Have acetone available if you need to clean up. I waited 4 days to make sure everything had plenty of time to cure. Even after 4 days I found any clean up of the E6000 was quite easy. I could remove any glue by simply rubbing with my fingers until it balled up. The glue was not hard, more like rubber. Now we have had warm days and I had waited 4 days so this glue should have cured fully. In comparison, the Ultra Clear was hard, and I mean hard. There was no way I was going to clean anything off. You will need to be very clean when using this glue and clean up any spillage with acetone (nail polish remover) straight away. When it came to trying to remove the bails from the glass I was in for a surprise. Initially, everything seemed to be quite firm. I gave them all a little wiggle without anything moving. Then I started applying a little more force. Immediately, it became clear the E6000 was not holding as firmly. With a bit of sideways wiggling I managed to loosen the bails hold on the glass. With further wiggling they came away from the glass, ground tests and not ground tests. The ground tests may have held a little longer, but there wasn’t that much difference. There was no discernible difference between cleaned with spirits and cleaned with water only. Between the E6000 tacked off and those not I would have to say the tacked off tests seemed to give way a little easier. Not what I expected. About half of the tests left the glue on the glass, not the bail. This meant the adhesion to bail and glass was about the same. In all cases I could remove the glue from the bail and the glass with a little rubbing with my fingers. It simply balled up and came away. It never actually became hard as I expected. Even a couple of days later I could remove the glue from the bails and glass. Regards the Ultra Clear tests, I managed to remove some of these as well, though it took a lot more force. I found sideways wiggling was not as successful as pulling the bail directly away from the glass. But there were three bails I could not remove. 2 tests with the glass ground, on spirit cleaned and water cleaned glass were there to stay. Another one, water cleaned but not ground glass also was not about to be removed. I applied enough force that I was concerned with the glass breaking in my hands so I did really test it. All the Ultra Clear tests were definitely harder to remove from the glass. The glue on the bails I removed could not be removed easily. I doubt even acetone will remove it. It would need grinding. All the tests did come away cleanly from the glass, not leaving anything at all on the smooth, or ground glass. This meant the adhesion was stronger to the bail than the glass. I did alternate between the E6000 tests and the Ultra Clear tests to be sure I was using very similar force on the bails, so I am confident I was not applying more pressure to the E6000 tests. I have to say I will be using the Araldite Ultra Clear for the time being. The ease with which I could remove the E6000 test bails was a big worry. Sure, I know most people wouldn’t be applying the pressure I did, but jewellery can still get quite a bit of wear and tear. I also think it essential to mix only small amount and not use anything that has started to go off. Though I can’t prove it, I suspect that once the glue starts to go off its effectiveness is diminished. I will be buying the Ultra Clear pack with individual tubes. This will make it easier to squeeze out equal amounts. The dual tube plunger may seem like a good idea, but falls down in practice. What will happen with time, I am not sure. I am not sure the E6000 will ever harden. It will probably always remain rubbery. But this may be an advantage with time. The hardness of the Ultra Clear may be its failure. It may become brittle with time and the E6000 may not. Not sure. Time will tell. Anyway, to be safe we will be giving a guarantee with all our pieces so if necessary we will repair any pieces that fail. While there are many other factors to consider, I think these tests are valid. Hope this has helped. Just out of curiosity, I soaked a glass pendant and bail glued with Ultra Clear in acetone overnight and could not remove bail. I tugged at it very hard and it would not give. Obviously, once the Ultra Clear is set it is there for good, or at least a long time.